Is nominal, ordinal, & binary for quantitative data, qualitative data, or both? Qualitative (Nominal (N), Ordinal (O), Binary(B)). One picture has NOB under Qualitative, the other has it under Quantitative. Which one is correct? These typologies can easily confuse as much as they explain. For example, binary data, as introduced in many introductory texts or courses, certainly sound qualitative: yes or no, survived or died, present or absent, male or female, whatever. But score the two possibilities 1 or 0 and everything is then perfectly quantitative. Such scoring is the basis of all sorts of analyses: the proportion female is just the average of several 0s for males and 1s for females. If I encounter 7 females and 3 males, I can just average 1, 1, 1, 1, 1, 1, 1, 0, 0, 0 to get the proportion 0.7. With binary responses, you have a wide open road then to logit and probit regression, and so forth, which focus on variation in the proportion, fraction or probability survived, or something similar, with whatever else controls or influences it. No one need get worried by the coding being arbitrary. The proportion male is just 1 minus the proportion female, and so forth. Almost the same is true when nominal or ordinal data are being considered, as any analyses of such data hinge on first counting how many fall into each category and then you can be as quantitative as you like. Pie charts and bar charts, as first encountered in early years, show that, so it is puzzling how many accounts miss this in explanations. Put another way, you can classify raw or original data as first reported and as appearing in say the cell of a spreadsheet or database. But its original form is not immutable. Imagine something stark like a death from puzzlement from reading too many superficial textbooks. That can be written on a certificate, but statistical analysis never stops there. There is an aggregation to counts (how many such deaths in a area and a time period), a reduction to rates (how many relative to the population at risk), and so on. So, how the data are first encoded rarely inhibits their use in other ways and transformation to other forms. The etymology of data is here revealing: translating the original Latin literally, they are as given to you, but there is no rule against converting them to many other forms. All, I couldn't find one picture that put everything together, so I made one based on what I have been studying. 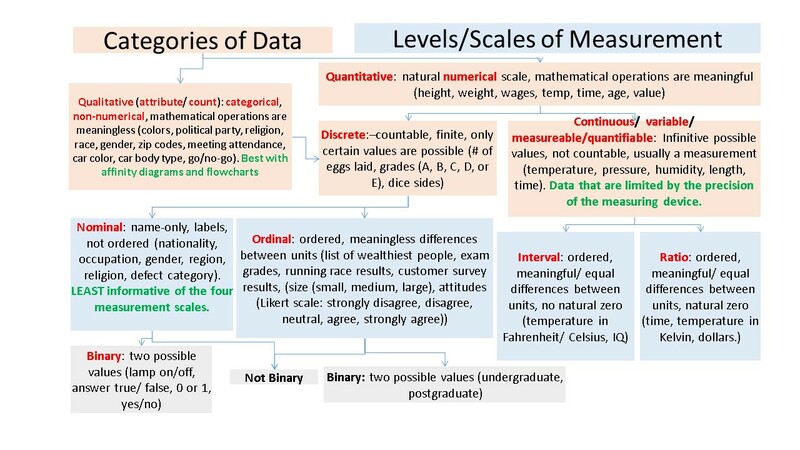 Putting the scales of measurement on the same diagram with the data types was confusing me, so I tried to show that there is a distinction there. It depends what you mean by "quantitative data" and "qualitative data". Did you vote for Obama, Romney, someone else or no one in the presidential election? What sort of data is this? The variable is nominal: It's only names, there is no order to it. But many people would call it quantitative because the key thing is how many choose which candidate. That's as opposed to qualitative data which might be transcriptions of interviews about what they like best about Obama (or Romney or whoever). A better way to look at it is to clearly distinguish quantitative data from quantitative variables. Neither of these charts are correct. They are rather nonsensical and you are right to be confused (aside from the contradiction). They seem to be conflating the ideas of fundamental variable type and variable selection to model a system (with a pdf). There are 3 fundamental variable types (excluding subtypes): Nominal (categorical/qualitative), Ordinal, and Continuous (Numeric, Quantitative). Ordinal has both a qualitative and quantitative nature. Attribute is not really basic type but is usually discussed in that way when choosing an appropriate control chart, where one is choosing the best pdf with which to model the system. This is sometimes called "attribute data", but it's type is nominal (aka categorical etc). Like Nick mentioned, we count nominals, so it can be confused with a numeric type, but its not. I found this question while searching about levels of measurement and related concepts. I think the charts in the question lack the context. When we do the categorization we define the rules for grouping the objects according to our purpose. So what is the purpose? And are we talking about the variables? nominal: attributes of a variable are differentiated only by name (category) and there is no order (rank, position). ordinal: attributes of a variable are differentiated by order (rank, position), but we do not know the relative degree of difference between them. interval: attributes of a variable are differentiated by the degree of difference between them, but there is no absolute zero, and the ratio between the attributes is unknown. ratio: attributes of a variable are differentiated by the degree of difference between them, there is absolute zero, and we could find the ratio between the attributes. And this is only one approach from Stanley Smith Stevens. There are several other typologies. continuous variable can take any value in this range. The number of permitted values is uncountable. while for discrete variable the number of permitted values in the range is either finite or countably infinite. Not the answer you're looking for? Browse other questions tagged categorical-data dataset ordinal-data binary-data or ask your own question. Are all attributes/data points inherently nominal? How to test the inter-rater reliability of a nominal coding process that generates ordinal data? Explanation of the different variable types in statistics? Is this variable ordinal, interval data or discrete?